Thank You SAN ANTONIO for your wonderful Love and Suport!! We are overwhelmed with your tremendous response and will continue to amaze you with our authentic recipes and tickle your taste buds. The Grand Buffet on the inaugural day featured a lavish buffet ever to be offered in the city allured the enthusiastic crowd. With immense pleasure we showcase our “Lunch Box To Go” and Lunch Thaali Veg & Non-Veg during weekdays which will make your everyday meal even more delicious and special. Get Set Go for our Unlimited “Dosa Night” on Thursday with all you can eat Dosa specialties presented in our own unique fashion. Gear up this weekend at our sumptuous “Special Grand Lunch Buffet” Friday, Saturday & Sunday with our diversified and creative recipes. Our team here is committed to deliver you Food that will be a Fond Memory. “Rajugari Bhojanam” our innovative concept, will be here soon at our location to show case the pride of Indian food royalties. Huge selection of our Menu includes 18 varieties of Biryanis and serves the truly native spread for the Indian Diaspora and make you feel the perfect spice with Desi touch. Thanks again…. Hope you all avail and enjoy our services! 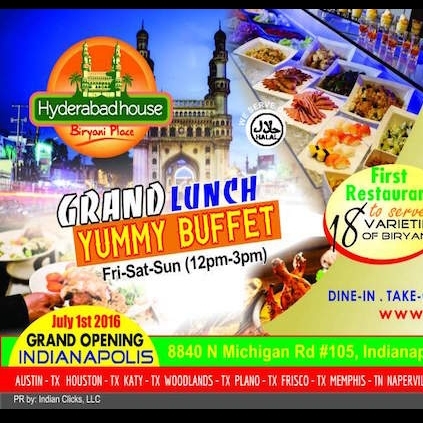 Visit http://www.hyderabadhouse.net for more information!! People looking for online information on Hyderabad House, San Antonio will find this news story useful.